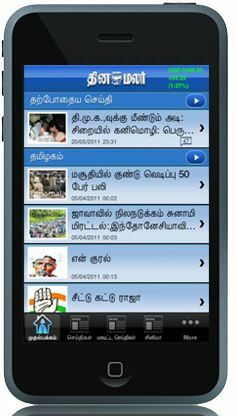 Dinamalar has unveiled an iOS app, offering news from around the world, India and Tamil Nadu in particular. The app, which works on the iPhone, iPad and iPod Touch, was developed by Udupi based software product development firm Robosoft Technologies. Robosoft has previously developed iPhone apps for news portal OneIndia.in. Adimoolam Lakshmipathy, Executive Editor, New Media, Dinamalar, said, "People are always on the move today and moving into the mobile space was a natural progression. The move to create an iPhone and iPod app is just an extension of our commitment to keep people informed 24x7." Indian dailies Times of India, HT Media (Hindustan Times) and Mint also have iPad applications. Even as telcos Airtel and Aircel have begun marketing the arrival of the recently launched iPhone 4 in India, media houses are betting on apps such as these to boost traffic to their online properties. Dinamalar has said it expects the apps to increase the number of hits Dinamalar.com receives in a day. The website currently records over 20 million visitors per month, according to the company. The iPhone app was in answer to a demand from consumers, according to Balasubramanian, Head â€“ Marketing (New Media), Dinamalar.com. He said, "The publication's move to create iPhone and iPod apps was a necessity and in answer to our dedicated users' demands. With Dinamalar.com holding a majority share of online traffic in Tamil News readers, we felt compelled to ensure that our readers have enhanced all-time access to the real-time news that we provide no matter where they are." The Dinamalar app (available on the iTunes store here) offers news in various categories - from business, cinema, sports to astrology, and also features a news section for NRIs. It will also deliver live cricket updates as well as photo and video content. The app will allow users to share news and updates on Facebook and Twitter as well as email, and in addition give readers the option to share their comments.